Learning the best way to clean a garage floor properly is a skill that is high on most home improvement lists. It is a critical aspect for any project that involves prepping a floor for paint, an epoxy coating, or for just creating a nice clean garage floor free of spills, stains, and contaminants. Depending upon what type of garage floor project you have chosen and how dirty your floor is, there are different methods of cleaning a concrete floor that you may want to engage. We will discuss each of them as we go in order to assure a successful outcome. If your goal is to eliminate pet urine odor and stains, then we have a separate article for that here. For the best success, the first thing you want to do is remove everything from the garage floor that is not anchored down and sweep out the heavy dirt and debris. As obvious as this seems, there are people who don’t want to do this and they are the ones who always end up ruining something due to water damage. If you have painted drywall in your garage or low electrical outlets, you may want to cover the lower 3ft. by taping a few cheap plastic drop cloths to the walls to avoid water spots or shorts from electrical damage. , and some good old fashioned elbow grease. If you don’t have a degreaser, Tide laundry detergent or TSP (Trisodium Phosphate) are excellent substitutes for cleaning concrete. Mix the cleaning agent of choice into a large bucket of warm to hot water. For Tide we like to use a ratio of 1/3 cup of Tide to 1 gallon of water. Follow the recommended directions for the TSP or degreaser. It is easiest if you divide your floor into sections as you clean. Pour your warm soapy solution onto a section and start scrubbing with your deck brush. For particularly dirty floors it helps to let the solution set for a few minutes after your initial scrubbing in order for it to work on the dirt and grime. After it has set for 5 – 10 minutes, add a little more solution and scrub again. Follow that up with a good rinsing with your high pressure nozzle and then move on to the next section. What’s important here is to make sure that the solution you are scrubbing with does not start to dry up before you rinse it away. The reason for this is that the contaminants in the pores of the concrete are emulsified and lifted out in the solution while it is still wet. This makes it easy to rinse out with the high pressure nozzle. If it starts to dry out, these contaminants can be left behind with the rinsing. 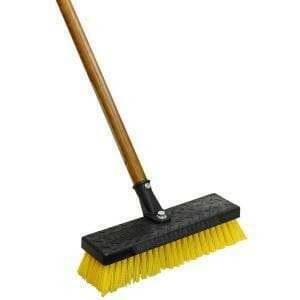 Tip: Push brooms make a poor scrub brush. The bristles are too long and the surface area is too large to apply good pressure. Purchase a cheap deck brush with the short stiff bristles. These work best. Once the floor dries you should have a nice clean surface and can inspect for any tough areas that need to be spot cleaned such as grease and oil stains. Concrete is porous and can really become embedded with dirt and grime over the years if it hasn’t been cleaned very often or at all. If you are dealing with a floor such as this then you do have some equipment options that can make the job easier and work great at getting the dirtiest of garage floors clean. The first of these is a pressure washer. Pressure washers can save a lot of time in scrubbing and are excellent at cleaning concrete. Most will allow you to add a degreaser to the water for additional cleaning action. You can read more about pressure washers for garage floors here. They are not very expensive to rent and you can usually find them at your local home improvement or equipment rental centers. For effective cleaning, a minimum 3000 PSI washer should be used with a water flow rate of 3 gallons per minute or more. The key to using a pressure washer is to presoak the concrete with the cleaning solution first for 10 – 15 minutes. Work in sections as stated above. Once the area has soaked, add more water to the floor and use the pressure washer to start rinsing the grime away. The yellow 15 degree fan tips work best for dirty concrete. For particularly stubborn areas such as stains, you can use the more powerful turbo tip. Just be careful not to linger too long in one area when using a good pressure washer and keep the tip moving. Because the water action is so abrasive, you can actually etch the surface of the concrete if you are not careful. The second equipment option you can use is a floor buffer (also known as floor maintainers) with a nylon scrubbing head for concrete. You can rent these inexpensively as well. Be sure to tell the rental company that you will need a head for cleaning concrete. Home Depot is a great resource for these. 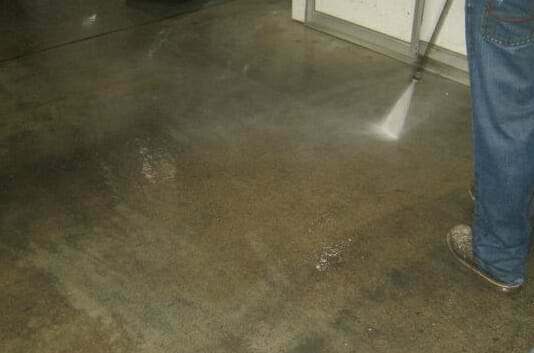 When using a floor buffer you will clean the concrete in the same manner as if using a deck brush. Just substitute the floor buffer for the deck brush. Take your time as you go and let the buffing machine do its work. You may have to add a little water as you scrub to keep the solution wet and foamy. These can do wonders to some concrete with the floors turning many shades lighter after scrubbing with a floor buffer. With the heavy cleaning done, you can now tackle the oil and grease stains that were not completely removed by the scrubbing. Wet the stain and surrounding area first then apply your degreaser to the oil spot in full strength. The reason for wetting first is to prevent the contaminants in the stain from spreading to a dry area. Scrub the degreaser in and let it sit for a while. Apply more degreaser, scrub, and then rinse with the high pressure nozzle. Mixing a heavy concentration of Tide into something closely resembling a liquid paste works well also. Just make sure the concrete is wet before you apply it and scrub it in. Again, let it sit without drying out before you rinse it. These methods will take care of most standard oil and grease spots. If these methods don’t remove all the oil stain, there are advanced methods for removing oil stains below. Be advised that older stains that have been in the concrete for a long time will still have some discoloration. To make sure that you were successful in removing the oil, test it by sprinkling a few drops of water onto the surface. It should not bead up. If the water doesn’t soak in or beads up on the surface, then that is an indication that it was not all removed and you may have to clean it again. There are a few ways in which to rid your garage floor of rust stains. For small spots, the simplest is to use either lemons or white vinegar. The white vinegar is easier to use if the spots are larger. Squeeze the lemons or pour the white vinegar over the stain and let it sit for 5 minutes or more. Add some more lemon juice or vinegar and then scrub with a good stiff brush. Rinse well with water and repeat if necessary. A high concentration of TSP mixed with boiling water works wonders on rust as well. Be sure to let it sit on the stain for about 15 to 20 minutes before scrubbing. Repeat if necessary. Oxalic acid is another product that is even tougher on rust stains. You can generally purchase it from your local home improvement center or hardware store. Some concrete cleaners for rust stains have it as an ingredient. It may even come in a powder form which you mix with water to make a soupy paste. Apply the Oxalic acid to the stain and let it sit for 5 minutes before scrubbing. Be sure to rinse real well afterwards. Again, repeat if necessary. For the toughest of rust stains a mild solution of muriatic acid will work wonders, but you need to be careful when using it. We suggest a ratio of 10 parts water to 1 part acid to start. More isn’t always better in this regard unless you are preparing your concrete for a floor coating. If you mix it too strong right away it will etch the concrete which will make it look different from the surrounding concrete. Safety Tip: Do not pour water into acid – pour the acid into water instead. Pouring water directly into acid can cause it to explode in a gas that can splash back in your face. For more instructions on how to use acid on concrete we suggest you read this post here. If you are applying a coating to your floor, you will need to remove any type of residue on the surface such as a thin filmed topical sealer, old paint, or mastic. This needs to be done first before any attempt is made at cleaning. There are two different methods you can use depending upon what is on the concrete. The first would be a chemical stripper. We highly recommend a couple of products that are available from Franmar Chemical that are environmentally friendly and very effective. The first product is called Bean-e-doo and works great for removing mastic. The second is Soy Gel and is very effective for the removal of old paint and urethanes. These type of products are more expensive than solvents and take a little more time to work on the product (chemically, not physically), but are much more safe for you and the environment. If you are cleaning the garage floor before laying down a floor covering such as roll out mats or interlocking tiles, then removal of old sealers are not necessary. The other method is to use a floor grinder. Special grinding heads are available for the purpose of removing mastic, paint, and sealers. While it can be a more dusty way of dealing with old sealers and paint, it does require less elbow grease than chemical strippers. It does cost more however. You can read more about using floor grinders for concrete here. One important note to make; if you are planning on acid etching your concrete in preparation for paint or an epoxy coating, then you still must clean your garage floor as stated above. Acid works by breaking down the surface of the concrete to expose the pores. It will not clean away dirt or remove oil. If you plan on grinding your garage floor then you only need to treat the oil stains. Any other surface contaminants such as dirt and most rust stains will clean up with the grinding. 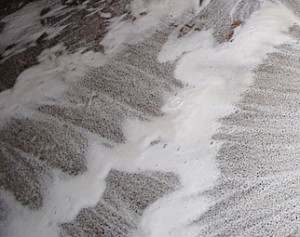 If followed correctly, you will find that these methods of cleaning a garage floor are highly effective. It is generally thought of as the least desirable part of any floor project or garage cleaning chore, but once done it will reward you with a nice clean concrete floor that is free of dirt and stains. My golf cart leaked battery acid onto the cement floor. I now have a large red stain . How can I remove it. Hello Robert. We always recommend neutralizing it first to see if it will rinse away. Mix a thin paste of baking soda and water together. Scrub it into the stain with a stiff brush and allow it to sit for about 10 minutes. Rinse it with fresh water while scrubbing with the brush. If this doesn’t remove it, then the method that works for sure is to use a a 4-1 solution of water and muriatic acid. Remember always add the acid to the water, not the other way around. Pour the solution onto the stain and agitate it with a brush. Let is sit there until it quits bubbling. When it quits, neutralize it first with some baking soda and water then rinse it away. How do I clean newly-leaked car oil from a sealed concrete garage floor? We recently moved into the house, and I have no idea what kind of seal/cover was used, nor how long ago it was done, although it looks to be fairly recent. A car dripped oil for several days before I noticed, and now we have an oil spot about 4 ft square. We can read about how to clean oil stains here Ted. We have an article here. Last night we used muriatic acid with water to scrub our floors with a deck brush. We scraped away all the paint spots. We assumed you just let it dry and we were going to sweep away the remaining paint pieces that were scraped up and then roll on a clear coating on top. Now after reading all this I see we were so wrong! What do I do now? We don’t have a pressure washer we can use. Walls are drywalled and painted. Hello Gina. What does the concrete look like right now? Is all the paint up? Hello Dave. We suggest you read our section on garage floor repair and read this as well to get a better idea of the work and product required. In the house we are buying the owner acid etched the bedroom floor and painted over it. The problem is, the acid smell is still there and smells like cat urine. How can I remove the smell. We are guessing that he did that to try and hide the cat urine problem Mike. The problem with that, however, is that concrete paint breathes. If it was a male cat, you may want to check the walls as well. As far as the floor goes, you would need to remove the paint with a paint stripper or by grinding. After that, clean the concrete well and then use one of the special enzyme cleaners for pet urine. 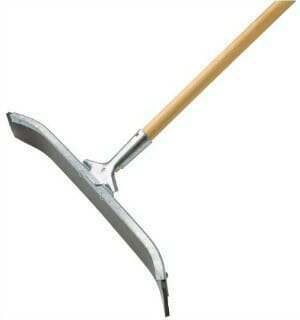 This article here does a good job of explaining how to use these type of cleaners on concrete. How would one clean black soot off of a concrete floor? I’ve tried various soaps but there’s still some left. Soot can be difficult Eric. Many times using a pressure washer is the best bet. I had no clue that lemons or white vinegar could help remove rust stains on concrete. I can see why this would be important to be know if you think that rust might eventually get on the floor and will need to be cleaned. It might be a good idea to talk with the concrete installers about how to properly take care of it after they have put it in. They might have ideas that other people might not know. I plan to paint the concrete floor in my newly erected garage. The floor was “power” floated, but not to a highly polished finish. If I key the floor with an electric sander using 150/180 grit sandpaper, is there any need to acid etch the floor before painting? I was also planning to use a universal concrete primer before painting it. Is this necessary, should I just “thin down” the first coat and then apply a second coat of paint? Hello Phil. Sandpaper is not going to survive concrete. That is why diamond grinding wheels/disks are used. If you are going to “paint” the concrete and not epoxy coat it, then it’s recommended to use the manufacturer’s suggested concrete paint primer. If you are going to “epoxy coat” the concrete, then the use of a primer is determined by the type of product you are using. I purchased the Rustoleum Garage Floor stripper, which I have used three times before this… I am thinking maybe I got a bad container? My porch is a mess….. I dont even know what to do? All glues together… cant even scrape it up???? HELP???????? Hello Sandra. This particular product has created a lot of unhappy customers. You have a couple of options. First, we recommend contacting Eco Building Products and talk to them about your issue. They have an excellent soy gel paint stripper by Franmar that is eco friendly and should work to fix your problem. The other solution would be to grind your concrete in order to remove the paint. Hello, I have a garage that I have turned into a 2 bedroom, 1 bath rental property and I’m on a tight budget. The drywall is all done and I’m getting ready to prime and paint the walls . I have most of the drywall dust cleaned off of the concrete! The concrete floor had never been sealed. I can’t use a pressure washer. I would like to clean the concrete with something like lemon juice, baking soda or vinegar. I want to seal the concrete so what process can I use that would be cost efficient and easiest to accomplish? Help! Hi Tina. When you say you want to seal the concrete, what type of product are you considering? What do you want it to do for you? How you clean the concrete depends on what you plan to seal the concrete with. I wanted an answer just likeTina asked. Tell me a good idea as to give the floor a tint of color with a shine.. The floor is a 2 year old, clean, never sealed shop/ indoor floor. Hello Joyce. You have a couple of options. The easiest is to use a tinted acrylic sealer. Tinted acrylics are translucent in color and can provide a glossy finish. The other option would be to dye the concrete to achieve a more solid color and then apply a clear acrylic sealer. This article talks about MMA acrylics which are the most durable. Legacy Industrial has their tinted HD6525 MMA acrylic here which is a good example. white spot. How do I remove it. Hello Saundra. Apple Cider vinegar is actually a mild acid and may slightly etch the concrete. It can make the concrete more white since it has exposed fresh concrete at the surface. Try a solution of baking powder and water to neutralize the reaction. Scrub it lightly with the solution then rinse it well. It may still look white, but that will fade as the concrete starts to get naturally dirty again. My husband recently repaired the drywall in our ten year old garage, retaping almost every joint. He didn’t cover the floor and now there is joint compound all over the bare cement. We plan on painting the floor with an epoxy system (haven’t figured out which one yet). Can we wash the floor with a degreaser or tide as you outlined on this site or do we need to use something different? The joint compound is pretty ground into the floor at this point. Thanks for your help. Yes, just scrub the floor well with a good cleaning solution and most of the joint compound will come out Jude. The concrete will need to be prepared properly by either grinding or acid etching before an epoxy system can be installed. This will remove any of the remaining joint compound in the process. OK Shea, thanks, your are a great help. My main question, not well stated, is whether or not I need to do further dilution of the 31.45% Cleaner that I described from Lowes. Since you said that one might start with a mix of 1 part acid per 5 parts of water, I assume that is equivalent to about 1/6 = 17% dilution. So I would need to add water to bring the as-purchased solution down from the 31.45% stated on the bottle to about 17% — before applying it to the concrete … am I looking at this correctly? Yes, you have the right idea Bob, but it doesn’t need to be so complicated. The acid you can purchase from the home improvement centers needs to be diluted or you will damage your concrete. What most people do is mix a 3:1 ratio of water to acid to get the best etch. If you are concerned about using too much acid, you can test for results starting with a 5:1 ratio of water to acid and then examine the concrete. Also, to be safe always add the acid to the water – not the other way around. Any tips for getting pet (rabbit) urine out of basement cement? It doesn’t smell, but it’s high in calcium so it’s kinda chalky white. Thanks!! If you don’t have any odor Emily, TSP works very well at removing the bacteria and white residue. Mix 1/2 cup of TSP to 1 gallon of hot water. Pour it on the area and scrub with a short bristle brush. Let it sit for 5 to 10 minutes without drying out. Once you do that, pour some clean hot water on the area to rinse it and then vacuum it up with a wet vac. You will need to rinse it at least 2 or 3 times. If I am planning to apply an epoxy coat to my garage floor, is this the correct sequence of prep tasks? Grind floor; repair spalled and pitted concrete; clean light stains with degreaser. Is it redundant to clean with a degreaser if I am grinding the floor? Thanks! If you have any degreasing to do, Gary, you will want to get that done first. After that, you generally you do your repairs and then grind. That way all your repairs are flush and even with the rest of the floor. However, if you have pitted and spalled concrete, sometimes it’s best to hit that area with a grinder first to remove all the loose and damaged concrete, do the repairs, then grind the entire floor so everything is flush. I am going to apply epoxy to a basement floor that is only 4-5 months old. I’ve power washed it with a TSP cleaner, it had no stains just some dirt. I am going to grind the floor now, after grinding is there any other treatment needed besides getting all the dust up before applying my 2 part epoxy? Did you moisture test to make sure you don’t have any moisture issues with the concrete? If so, then everything else looks good, Mike. Yes I did the moisture test in 3 different locations, no moisture at all in any of the locations. I ended up just doing using this Concrete Prep Tool from Home Depot. It seems to have done a good job, if I pour some water on it it dries up pretty quick. What is the best way to get up all the dust, shop vac, or is there any chemicals that prep the floor better before applying the epoxy? Just use a good shop vac, Mike. You can always wipe the surface with denatured alcohol to get any remaining dust if necessary. Hi, would like to know how to get rid of long white stains left by me forgetting that my car has evaporating problems from cars AéC system in the got summertime. They are two years old now. I used lacquer thinner but now I have a huge huge white area stain. Hello Al. Try using a solution of 1 part vinegar to 3 parts warm water on the stain. Pour it on, scrub with a good brush, and then let it set for 5 minutes without drying out. Rinse afterwards and see how it looks after it dries. We had a fire. Our garage burned to the ground. We are hoping to rebuild on the original concrete foundation. We have cleaned up the debris and are now left with nothing but a sooty, oily, black slab. How do we clean the concrete? What do we do? Can we bring the floor back enough to rebuild on it? Hi Lisa. We are sorry to hear about the loss of your garage. Removing soot and the accompanying oils from concrete due to a fire is not easy. We suggest starting with a high alkaline concrete degreaser targeted towards oil removal. These here are all good examples. 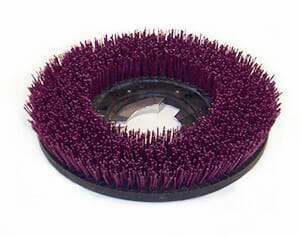 Use these in conjunction with a floor maintainer with Malish brush for concrete. A Malish brush has very stiff nylon bristles for cleaning. Soak an area of the concrete with a strong solution of the degreaser for a few minutes and then attack it with the floor maintainer. Rinsing with a high PSI power washer is ideal. Pressure washers use cold water where as power washers use hot water which will help to break down the oils. Hopefully that combination will get the majority of the concrete clean. We’ve seen this work before, but your results really are dependent upon how bad the concrete has been burnt. You may want to test in an area first to get an indication how it will work. Providing it works well, grinding the concrete surface with an aggressive grinder afterwards may help to remove most left over residue. After that we suggest sealing the concrete since the open pores from cleaning and grinding will act like a sponge for dirt, debris, oils, and ect. I had someone stain our concrete in the living area of our home. The concrete was newly poured and had been there about 6 months. We were cleaning in corners and next to the wall and noticed that the stain was coming up when we had to scrape a little. Also, in one of the rooms the Tyvek covering had come up and there was a spot that got a lot of traffic and there was no stain just bare concrete. Is this normal or was there an issue when the floor was cleaned? Hello Don. It sounds like they did not use a true stain. 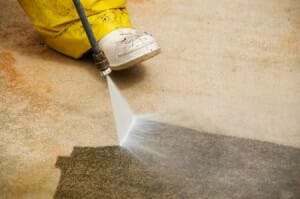 Acid stains, solvent based stains, and water based stains permanently stain the concrete. You can read more about stains here. Once the concrete is stained it requires that a clear coating be applied. This brings out the color and protects the concrete. If the coating was scratched down to the concrete for some reason, the stain would still be there because it is in the concrete and not the coating. We would be willing to bet that a product like Behr concrete stain or something similar was used. They are essentially a low solids, thin acrylic coating with color added. They can peel right up if the concrete was not prepped properly. If they peel or get scratched they will reveal bare concrete underneath. Another clue is if the stain is fairly consistent looking throughout. It looks that way because the color is laying on top of the concrete. We have an issue with these companies calling these products stains because they really do not stain the concrete. True concrete stains create a mottled and variegated look throughout the concrete. I am in the process of preparing my garage floor for epoxy. I have gone through with a degreaser and have good wet-ability now. But there are still stains and rust marks. Is it necessary to remove these in order to get a good bond with the epoxy? I will be grinding tomorrow as the final surface prep step, but I am trying to clean up any contaminants that grinding may not fully remove. Any insights would be much appreciated! Hello Brock. Any heavy petroleum stains or rust should be cleaned as best as possible before grinding. Grinding will help remove much of this as well. Do a water drop test after grinding in those areas. If the concrete immediately turns a darker color and readily absorbs the water, then you will be good to go. If the water just sits there or even beads, then you will have more cleaning/grinding to do. Any recommendations for removing rust spots and dirt build up and the base of the garage where cars drive in? Hi Sher. There are a few things that will work on rust stains. A 3 to 1 water and vinegar mixture works on light rust. CLR is a little stronger and works as well. For heavy rust stains, an acid etch will almost always work. For dirt build up, the cleaning methods we mention in the article work well. I just purchased a builders model home with no driveway and sales offices in the area where the 3 car gargage would be. The offices were just torn out and converted into the gargage. The top concrete layer of the garage floor sat on plastic sheeting. This top layer was removed to lower the floor level of the garage to that of the driveway that was newly installed at the time I purchased the home. I want to finish the garage floor – thinking about using a stain-sealer you recommended in a recent article. After I clean the garage floor with Tide and a deck brush, can I go ahead and begin the stain-sealer application? It is not necessary to acid etch this new concrete layer that has never been used is it? Hello Gregg. When you say the top layer of the garage floor was on plastic sheeting, do you mean a floating floor was installed on top of the plastic sheeting and then removed? If so, you will still need to etch the concrete for most coatings. Whether concrete is new or not has no bearing on it requiring a proper profile (grinding or etching). It all depends on what type of products you intend to use. 1.) Are we to apply only one coat of Primer? I’ve read on several sites that you can do more. 2.) If we do a high gloss clear coat, can we still primer? 3.) What roller type is needed for the clear coat? Hmmm…. primer coats are applied to bare concrete. Are you sure they were not referring to treating the first coat that you applied as essentially a primer coat? That would make sense to us. If you had some issues with the first coat it could act as the primer coat (AKA ugly coat). A second coat could then be applied on top to fix all cosmetic issues. If the first coat has been down more than a week it would not be able to achieve a chemical bond (too smooth) and would require roughing up the surface with 120 grit sandpaper first in order to achieve a mechanical bond. I’m willing to bet that what they are sending out to you is more of what you already applied. If that is not what you receive, I would give them a call to clarify. Once you apply your final color coat you can apply a subsequent clear top coat if you like. You should use the same type of roller that you used for the color coat.